Auger Boring - Services - L.J. KEEFE CO.
Auger-boring is a common, two-pass method for installing steel casing as a liner to accommodate a new underground utility (carrier) pipe. The casing diameter can be sized to accommodate any type of service pipe specified by the project's requirements. Steel Casing ranging in diameter from 12" O.D. to 84" O.D. Auger-boring is limited to installing smooth wall steel pipe. Ranging from 25 LF up to 600 LF. Standard dirt cutterheads are used for boring through clay and sand soils. The cutterhead can also be equipped with carbide tipped 'bullet' teeth for boring through full-face, soft rock and shale. 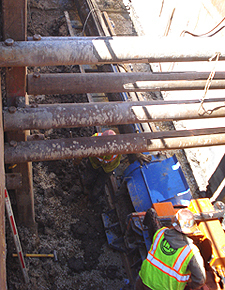 The steel casing pipe is machine bored (augered) and jacked-in-place simultaneously, so that there is no 'open excavation' in front of the casing. The soils are transported back to the work shaft by auger conveyance within the casing. A cutting head suitable for the ground condition is attached to the lead auger. The cutting head is positioned immediately outside the casing in stable soils permitting wing cutters to mine the face of the excavation heading one inch (1") larger than the casing, thereby reducing the friction on the outside wall of the casing. In the event unstable soils are encountered, the cutting head is retracted inside the casing. The cutting head, with full size augers behind it, prevents loose soils from surcharging into the casing. Grade of the steel casing is continuously monitored by water level and adjusted through the use of a steering head connected to the lead piece of casing. Line is checked at regular intervals by conventional surveying instruments and manual adjustments can be made as necessary.